How does it taste? It seems a little vegetably if you ask me, but the strawberries and bananas seem to make it maybe taste sweet? Hope your cleanse is going well!! Hi Cat! It actually taste delicious. 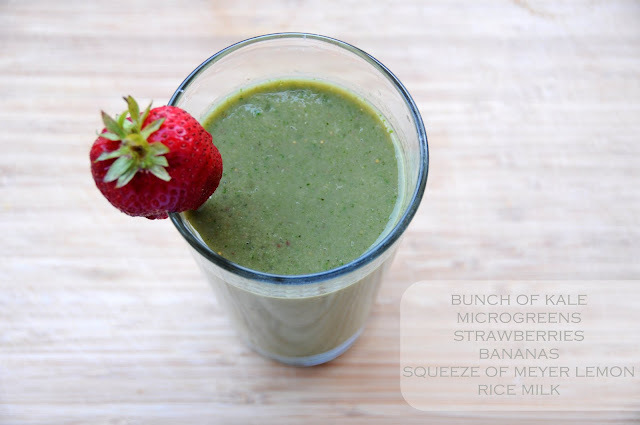 The strawberries make it sweet and the bananas and rice milk make it creamy. The microgreens are loaded with enzymes, antioxidants, anti-carcinogens and phyto-nutrients...BUT they really don't taste like greens in a smoothie which is awesome. and cleanse is going really well. Thanks for asking! I should have one of these everyday. Your juices and smoothies are intersting. I definitely want to give some of them a try since I've been going back and forth with the cleanse concept.